While RTCM is ostensibly about maritime service, by the vagaries of such things, they have also become the standard setting body in the United States for PLBs (Personal Locator Beacons). The RTCM SC110 sub-committee develops standards for PLBs, as well as EPIRBs. I have been involved for some time now as the sole “consumer advocate” on a committee made up of industry, manufacturer, government and search and rescue representatives. A revised RTCM standard for PLBs was approved just prior to the annual meeting (click for more about this revised standard). A revised RTCM standard for EPIRBs is next on the agenda. With this as background, RTCM is mindful of other technology that either competes or compliments the 406 MHz distress alerting technology and system, all of which impact the end user and SAR providers that RTCM serves. Thus, the impetus for this program at the annual conference. My PowerPoint presentation can be downloaded here as an Adobe PDF file (287KB). The audio of the presentation can be downloaded as a WAV file (1.9MB). I’m sure that someone with technical competence could combine the two, but as I lack such skills, I suggest you download and open both the presentation and the audio and follow along simultaneously. 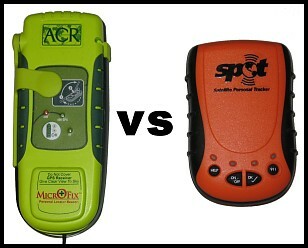 In summary, commercial distress alerting has hit the mainstream with the introduction of the SPOT Satellite Messenger. Others are on the way. I am not opposed to such services, nor against the concept of making a profit providing such services. They can offer a lot of advantages to consumers. However, there can be, and are in the case of at least SPOT, key differences between traditional distress alerting and commercial distress alerting. Traditional distress alerting measures its Return on Investment (ROI) in “lives saved,” not dollars earned. Adding profit incentive can potentially adversely affect outcomes if those involved don’t share this philosophy. It would appear that at least some involved may not have such vision. Otherwise, their policies with regards to subscriptions issues and lapses and the services provided, or not as is the case of SPOT, would be different. Both individuals and society have expectations of what a distress alerting service should deliver. If you don’t deliver on these expectations, you can find yourself in big trouble. In other areas of Emergency Services, fire and emergency medical for example, commercial operations have found ways to put the emphasis where it belongs, saving lives. So, it’s certainly possible to do so and make a profit. You just have to have the vision and the right attitude. In this regard, meeting societal expectations, SPOT has already stumbled in their implementation, but so far without any known fatalities. They and their chosen interface with SAR, GEOS, are learning and hopefully will do so quick enough to prevent problems. But, that is far from certain. Moreover, if every new commercial distress alerting service has to go through such a learning curve, sooner or later tragedy will strike. In addition, the lack of standards for this equipment and service has a huge potential for abuse and ruinous liability, aside from any tragedy. My message to SPOT and the other upcoming commercial distress alerting services is simple; get ahead of the problem or government will do it for you. Again, this is just a brief summary of the short 12 minute presentation. Please download my PowerPoint presentation and the audio of the presentation for the full story. NOTE: These comments are NOT at all related to a recent media release by ACR Electronics that seems to imply, incorrectly, that the Coast Guard won’t respond to a SPOT distress alert the same as a 406 MHz beacon alert. Please read about ACR FUD here. What Price Your Life? Distress Alerting as a Commercial Service was written on June 5, 2008 and filed in Gear, Musings, Survival Related Musings.